TFW2005’s early Transformers comic reviews continue! Today, we review Transformers Prime: Beast Hunters #4! Beast Hunters #4 is out tomorrow – Wednesday, August 28th – from IDW Publishing. Check out the review and a seven-page preview on our Beast Hunters #4 page of our Comics Resource Section! Wow so much for Beast Hunters the comic. Actually, they have. #8 is the last issue of the series. I hadn't heard that…I was hoping for a longer extension on the Prime-verse. I was under the impression this title was 'ongoing' until IDW says NO. Which they haven't yet. I like the idea of the Dinobots facing off against their original templates..I assume these are the actual dinosaurs Shockwave based them on – otherwise there would be no use of having them there. There's something irresistibly FUN about the concept of Dinobots vs. Dinosaurs that allows this to squeak by, but it's hard to deny that there wasn't enough real content in this story to fill out its two parts. Would've been better served as a single issue, methinks – but I'm looking forward to next issue, as I presume Scott is returning to the scripting, and her work on the first two issues was really great stuff I'm eager to see more of. I hope IDW have something else she can work on after this series ends. It's not the last issue, just the last issue in this arc. I think it joins up with the TV show soon. I'm glad this is the last issue. Should have been titled as a Fall Of Cybertron comic, not a Prime: Beast Hunters comic. There was barely anything related to the TV show or toyline. Zoom should have been a toy-only character from the Prime or Beast Hunters series. Not that it would have improved the story. A poor series from IDW but I had to buy it to know that it was a poor series. I didn't dislike it, its just more expensive for the content we're getting. For the same cost, we're also buying MTMTE and RiD. It's disapointing because issues 1 and 2 had a surprisingly strong little story with good characterization and interesting new bots/situations. To follow that with what feels like two issues of "filler" with generic Cons and long story-light fights just seems a waste. 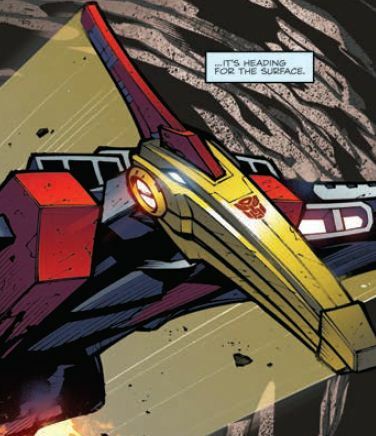 -ZacWilliam, if we got new and interesting internal monologue over the organic Dino fight that brought out new characterization or backstory I'd be more inclined to let it go, but pages of wordless fighting in a modern $4 comic is just painful. What an absolute joke. $3-$4 for almost nothing but giant, obnoxious, wordless splash pages. The entire issue could probably be read in under 2 minutes. Pick it up tomorrow and discuss here!